Snow canceled Christian Education and the 11am service on Jan. 13, 2019. Here are thoughts on the lectionary and the sermon. and through the rivers, they shall not overwhelm you; when you walk through fire you shall not be burned, and the flame shall not consume you. In the Epistle from Acts 8:14-17, the gospel penetrates a new field of ministry: Samaria. As Jesus promised before his ascension, the disciples’ testimony would fill Jerusalem and Judea, and would then penetrate Samaria on its way “to the ends of the earth” (1:8). Philip, one of the seven ministers or “deacons” appointed by the Church in Jerusalem to serve in the distribution of the food, fled the persecution that arose upon Stephen’s martyrdom. When he arrived in Samaria, he “proclaimed the Messiah” (8:5), and the news was received with joy. The Jerusalem church, which oversaw the spread of the gospel, sent Peter and John to confirm the creation of a new Christian community. The Holy Spirit authenticates this new mission through another outpouring similar to Pentecost. 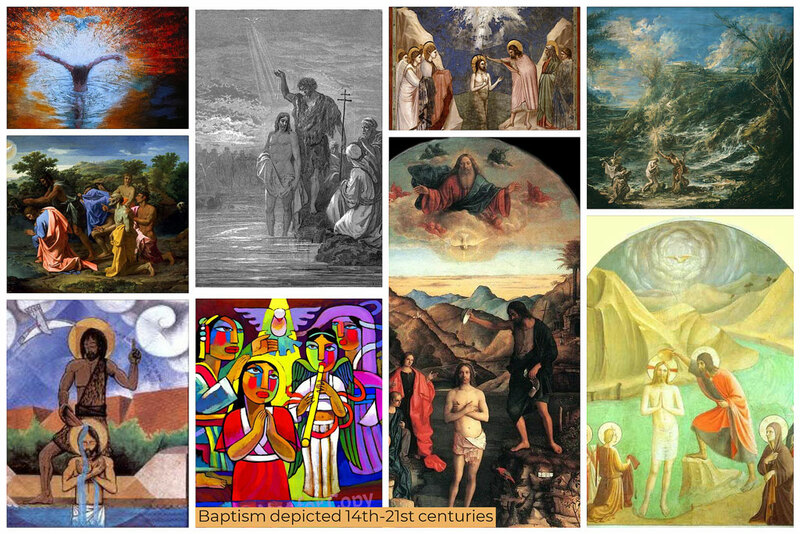 This week is Jesus baptism, a time for baptism and renewal of baptism in the church. All 4 accounts cover the story and there are similarities – the heavens coming open and the holy spirit descening on him like a dove and God proclaiming being well pleased with Jesus (except for John). As Jesus was praying (in Luke often a prelude to major events), the Holy Spirit descends. With the title formerly applied to the nation, to the king and later to the Messiah, Jesus is now openly called the Son of God, dramatizing and confirming what was implicit in his conception (1:35). Thus Jesus is anointed for his mission. In that spirit, people entered the waters of the river, and Jesus joined them. Not only is he baptized, he also hears the assurance of the Holy Spirit. A voice proclaims him God’s beloved, empowering him and sending him to the blind, the lame and the prisoners awaiting his good news. Those fortunate enough to have this power of love energizing their lives know what it must mean to Jesus to be so blessed. Knowing that he brings pleasure to the Father, he can accomplish miracles. Human limitations are forgotten in his joyous response to such affirmation. And what is true for him can also be true for us. The sermon was about handling disappointments, depressions and hurts in the midst of our baptism . “Sometimes we can’t feel God embracing us. We’re too depressed to sit in prayer, or we convince ourselves that we lack the time to sit in God’s embrace and to open our hearts to God in prayer because we’re too busy trying to fix what are often unfixable situations, or we just get depressed and give up hope. “Sometimes we can’t feel God embracing us because we’ve been led to believe in our own power and self-sufficiency. We believe that we have the strength, the wisdom and the understanding to, on our own, negotiate the tough times in our lives. “Sometimes we actively resist God’s embrace, like a small child throwing a tantrum and trying to struggle out of the parent’s loving, restraining arms. “Let me go!” “I hate you!” the child yells, and still, the parent holds on until the child finally rests, exhausted and safe, in that loving embrace. “These challenges happen to all of us and threaten to defeat us more often than we’d like to admit. “So the next time you find yourself crying out, “I hate this!”, the next time you’re lost, the next time you feel hopeless, go sit with Jesus on the riverbank after his baptism. “Sit on that muddy riverbank. Pray as you sit there with Jesus and listen for the love song that God has been singing to all of us, throughout time. “God holds us tight, and will not let us go, no matter what. “Because God talks with us and tells us.